Cycling appears as a simple thing to do but can turn intimidating to beginners. Having a bicycle is a great first step in cycling. After your first ride, you will want more of the freedom, joy and adventure you feel on the bike. For your start and success in cycling, here are the best beginner cyclist tips that will help you when you begin cycling. The bike you buy will probably be the only bike you have for some time. Getting it right is important so you can enjoy cycling. The bike should fit your budget, riding style and be of the right size for you. Different bikes are suitable for different uses such as exercise, off-roading, long rides and city cycling. Buy your bike at the local shop; they help you with setting up and other tips plus probably offer you free service for some time. Cycling gear is as important as having a bicycle. It makes rides comfortable and increases your safety. A helmet is one item that should not be missing in your gear. There are great cycling kits out there that include clothing for cyclists and other essential kit items. A few tools too will come in handy once in a while. The basics of fixing a tyre puncture are a necessity for every cyclist. Learn how to go about fixing a puncture as soon as you buy a bike. A pro could show you how to go about it. On rides, have enough kit with you to fix a puncture if need be. Riding technique helps you stay safe on the road and ride better. It includes how you use your brakes including the front brake, making use of momentum going up hills and other factors in cycling. Practice good riding technique so it comes naturally on the road. Analyse how you ride as you spend more time on the saddle. Your strength may be in sprinting or going uphill. Some cyclists enjoy going on solo rides while others prefer being in a group ride. Try to be well rounded while at the same time fostering your strengths so you can have fun out of cycling. 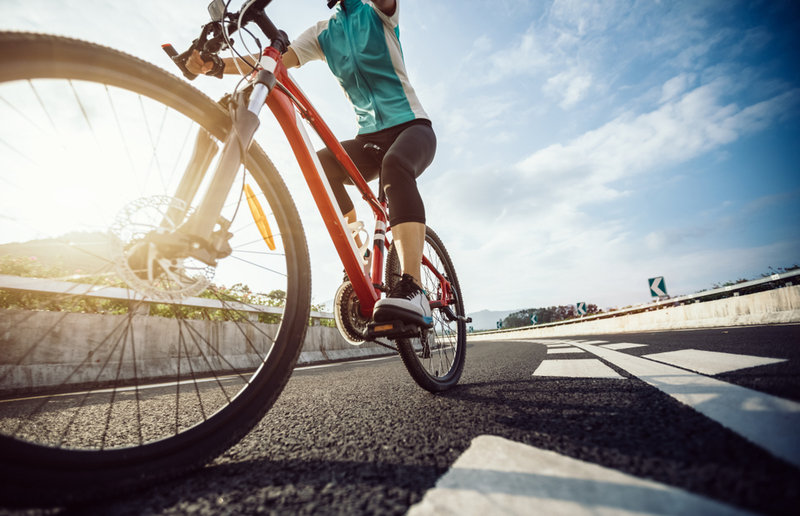 With your body adjusting to the new activity, your first rides will be tough. Sticking with cycling for some time will give you real progress quickly. However, do not push yourself too much in the beginning. Go at it with small yet steady increases in intensity and length of rides for best results. Get optimum saddle height for your bike and deal with any discomfort decisively. It may involve changing your saddle or buying padded cycling shorts; just get it done. A saddle retailer with a test ride service is great for saving you wasted cash. Chamois cream also helps with saddle discomfort. Gears on your bike are there to make your ride easier. Do not fight them. Use the gears with confidence going up hills, on the flats and downhill. Remember cycling is about keeping your cadence constant. Practice shifting on a flat road so it feels natural. Additionally, be confident about cycling on the road and obey the Highway Code. Other sports rarely require you to eat or drink on the go. Cycling is however unique in that you may find yourself on a multi-hour ride. Stay hydrated and do not allow your energy levels to go down. For every hour or so of riding, consider a snack or something else to eat and a few gulps of water. Read More: Hydration for cyclists: How much fluid and electrolytes do we need? Wear safety gear and equipment while riding. You should also obey the local laws governing road use. Use appropriate hand signals and do not assume drivers coming up behind you can see you. Being aware of your surroundings helps you anticipate drivers and hazards. Do not wear earphones or headphones while cycling. Read More: Riding Safely On A Time Trial Bike: Remember These 4 Key Tips! You may be highly motivated to cycle, but a little positive pressure also helps. A cycling group or club makes cycling physically easier and motivating. The years of experience you tap into in a cycling group is simply amazing. These are the top beginner cyclist tips that will help you when you begin cycling. Use them to get a great start in cycling. Every cyclist you see was once a beginner cyclist. You will have your chance too to become absorbed into cycling. A beginner today could in a competitive race in a year or less, so take heart.